You've found the “Utah LaMancha Goat Breeders” page here at Hobby Farm Wisdom! If this is the first time you have visited our site: Welcome! The Lamancha breed is thought to have descended from Spanish goats brought by early settlers to California. It is a short-eared type of goat, found not only in LaMancha, but throughout Spain. The short ears are the distinguishing characteristic of this breed. There are two types of LaMancha ears: the gopher ear and the elf ear. In does, no type of ear differs from the other. In bucks, the maximum length of the gopher ear is approximately one inch, the elf ear has an approximate maximum length of two inches. LaMancha goats may be any color known to occur in goats. Through official testing, this breed has established itself in milk production with high butterfat. Can’t find the right LaMancha Goat in Utah? Check in: Colorado, Arizona, Nevada, Idaho, or California. 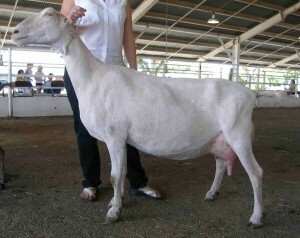 Or, to see a list of ALL the LaMancha Goat breeders in the US: Click Here!